Lifespan Development, 4th Australasian Edition (Hoffnung et al.) is an ideal resource offering for undergraduate students in both Australia and New Zealand enhancing their understanding of human development — from conception through to the end of life. 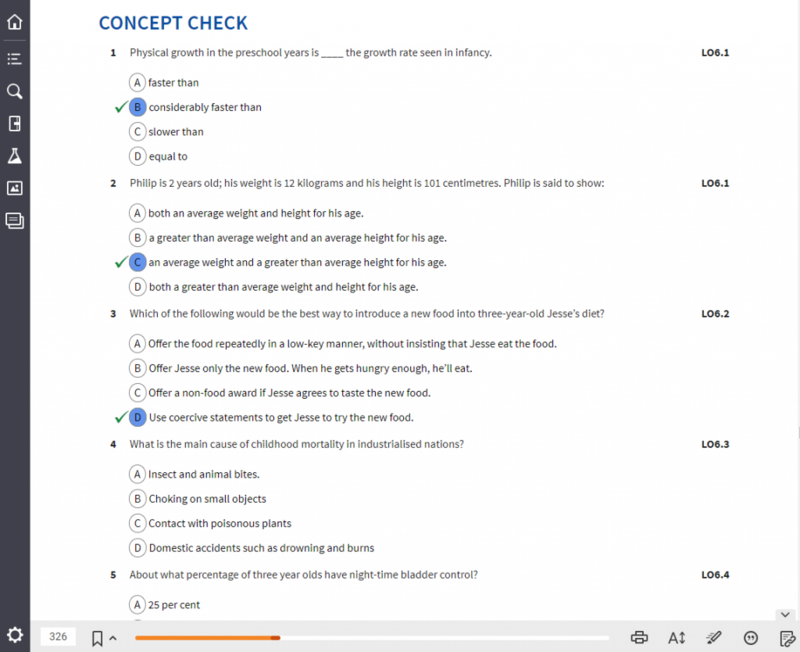 We recognise students are time-poor: Our Australian and New Zealand authors have hand-picked a restrained set of the best questions and videos to help students at the point-of-learning. 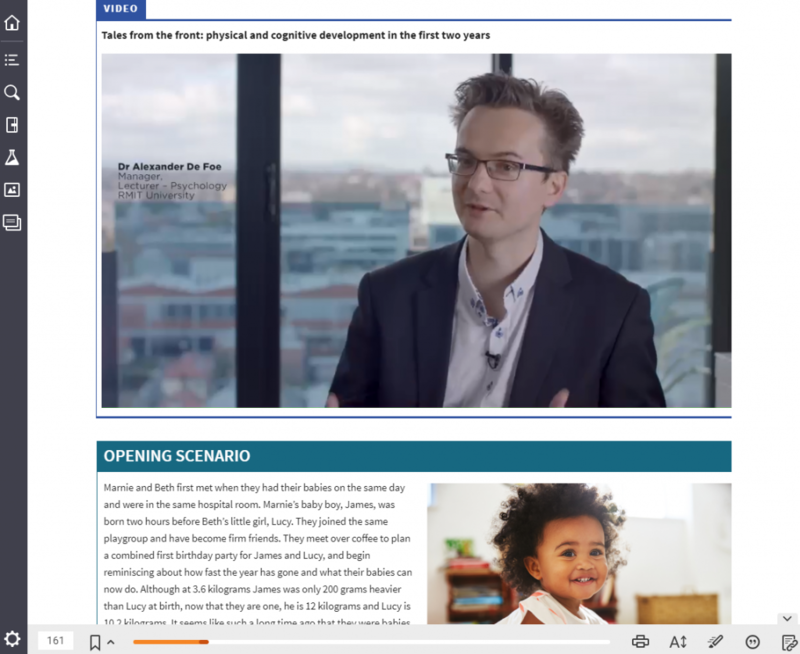 We make learning lifespan development concepts fun with local, real examples, multicultural views and theory in practice boxes, plus videos of local developmental psychology experts help bring concepts to life. 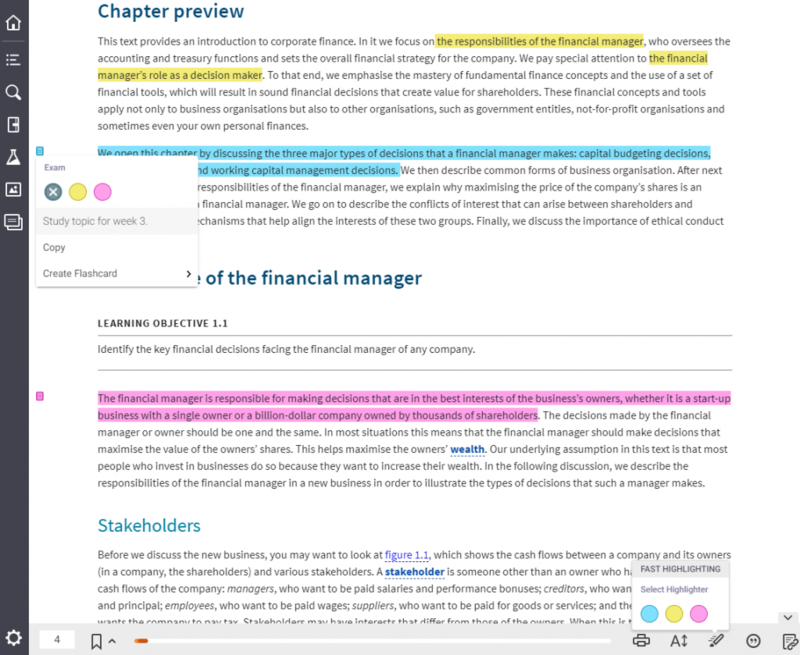 Students get the best of both worlds: A full-colour textbook with an interactive eBook so they can switch between reading something tangible and studying with the online (or offline) learning resources. Michele Hoffnung is Professor of Psychology at Quinnipiac University. She received her BA at Douglass College and her PhD at the University of Michigan. Her teaching has been in the areas of research methods, psychology of women, and adult development. She is editor of Roles Women Play: Readings Towards Women’s Liberation (1971) and author of What’s a Mother to Do? Conversations About Work and Family (1992) and numerous articles, essays, and book reviews. Robert J Hoffnung is Emeritus Professor of Psychology at the University of New Haven and Associate Clinical Professor of Psychiatry at the Yale University School of Medicine. Robert has taught about childhood, adolescence, and lifespan development; he has also done clinical work with children, adolescents, adults, and families. He received his BA at Lafayette College, his MA at the University of Iowa, and his PhD at the University of Cincinnati. He has published articles on educational, developmental, and mental health interventions with children, adolescents and families. Kelvin L Seifert is Professor of Educational Administration, Foundations and Psychology at the University of Manitoba. He received his BA at Swarthmore College and his PhD at the University of Michigan. Kelvin’s teaching has focused both on teacher education and on the education of adult learners outside of school settings. His current research focuses on how teachers and other adults form communities online in order to develop their own learning. He is author of Educational Psychology (1991), Constructing a Psychology of Teaching and Learning (1999), and Contemporary Educational Psychology (2009), as well as articles and chapters about gender issues in teacher education and on the dynamics of online adult learning communities. learning styles, motivation, intelligence, gifted and talented, and the development of thinking skills. Alison has 40 years of teaching experience and has taught extensively from preschool to tertiary education, specialising primarily in the areas of special education and gifted and talented. She recently retired but has been coaxed out of retirement to once again pursue her passion for teaching and learning at Western Sydney University. Cat Pausé is the lead editor of Queering Fat Embodiment (Ashgate). Her research focuses on the effects of fat stigma on the health and well-being of fat individuals and how fat activists resist the ‘fatpocalypse’. Her work appears in scholarly journals such as Human Development, Feminist Review, HERDSA, and Narrative Inquiries in Bioethics, as well as online in The Huffington Post and The Conversation, among others. She hosted Fat Studies: Reflective Intersections in 2012 and Fat Studies: Identity, Agency, Embodiment in 2016. Cat is also involved in sociable scholarship; her work is highlighted in her social media presence, Friend of Marilyn, on Twitter, Facebook, YouTube, iTunes, and her blog. Lynn Ward received her PhD from the University of Adelaide in 1995, and is a senior lecturer in the University’s School of Psychology. Since 1990 she has taught undergraduate courses in developmental psychology, adult development and ageing, cognitive psychology, and statistics, and a postgraduate course on clinical geropsychology. Her research supervision has covered diverse developmental topics including cross-cultural ageing, capacity assessment, resilience in parents, help-seeking in rural communities, leadership development, and health habits in older adults. She was awarded a Barbara Kidman Fellowship at the University of Adelaide in 2014, a High Commendation in the Stephen Cole the Elder Prize for Excellence in Teaching from the University of Adelaide in 2003, and was a national finalist in the UniJobs Lecturer of the Year in 2009. Her teaching is informed by her research on resilience and successful ageing, emotional functioning in older adults, and factors that influence age-related changes in cognitive abilities. Zealand. In 2003, she moved to Australia and took up a position at Central Queensland University teaching Biological Foundations of Psychology and Learning. Since then she has taught a range of courses including Intro to Human Development, Personality and Social Foundations of Psychology. Tania’s research interests fall within the area of human–animal studies with a particular focus on the role of animals within interpersonal violence and animals as facilitators of emotional and psychological development across the lifespan. Education at the University of Tasmania and is the Dean and Head of School. Before entering the university sector in 1994, she had an extensive career in primary, secondary and senior secondary teaching and school leadership in Tasmania, in both state and independent schools. At the postgraduate level, Karen coordinates a number of units relating to coaching and mentoring and health and wellbeing, and also supervises a number of research higher degree students. Her areas of research interest are in social and emotional wellbeing and student preparedness for teacher education. Karen’s publication output includes book chapters, academic journal articles and peer-reviewed conference papers. She is also a Consulting Editor for the Australian Journal of Teacher Education, and reviews for a number of international journals. Karen Yates is a lecturer with the College of Healthcare Sciences at James Cook University in Cairns. She is a registered nurse and registered midwife, with a strong interest and background in midwifery clinical care, education and maternity service provision. Karen teaches in both undergraduate and postgraduate nursing and midwifery programs, including coordinating a first-year nursing lifespan development subject with over 500 students enrolled across five campuses. She received her PhD in 2011 from James Cook University. Karen has a keen interest in nursing and midwifery education and the use of technology in teaching and learning. Her research interests include midwifery and new graduate nurse workforce issues, enhancing active learning for students enrolled across multiple campuses or in distance mode, and the use of technology and social media to enhance teaching and learning. Rosanne Burton Smith obtained her PhD in Psychology from the University of Tasmania and also holds a Masters degree in Educational Psychology from the University of Exeter in the United Kingdom. Her professional work as a psychologist includes several years in Papua New Guinea, mainly in educational and occupational psychology, and later in the United Kingdom and New Zealand, working in the area of developmental disabilities. Her teaching and research interests include psychological assessment, developmental issues such as childhood anxiety and the effects of divorce on children and adolescents, children’s peer relationships, body image, dietary behaviour and gender differences. Rosanne has taught and supervised research at both undergraduate and postgraduate levels in the School of Psychology, University of Tasmania since 1989. Rosanne retired from teaching in 2007, but continues as an Honorary Research Associate at the School of Psychology, University of Tasmania. 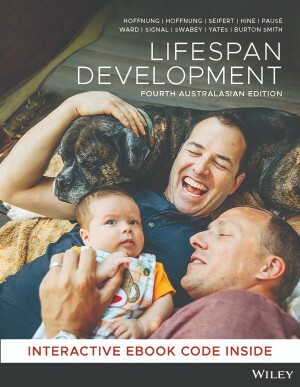 Students can purchase their Lifespan Development 4e Australasian Edition (Hoffnung et al.) textbook from Wiley Direct.